Unexpected Homeschool: Grocery Delivery - Where Have You Been? Grocery Delivery - Where Have You Been? I know I'm a little late to the party with this one, but in my defense the only grocery store I use didn't have this service until last week. At first I didn't even want to consider signing up for the delivery service from my grocery store. It is a great deal, especially with the initial promo of half price for the yearly fee. Still, being a fairly able-bodied person with a fairly able-bodied teenager, I felt a little silly. Except, those descriptions of us aren't quite accurate. It's what I want to think of us, but not a terribly honest description. On a good day, I'm fairly able-bodied with the emphasis being on the "fairly." I can not pick up anything that has any weight at all without causing immediate inflammation in my spine and days of immobility. My teenager does have dysautonomia and unstable joints from EDS. She also should not pick up heavy items, and cannot normally even manage a whole grocery trip before she is dizzy and in danger of another syncope episode. Still, she's young and kinda able-bodied. I've been finding these last few months that the smallest things exhaust me and I can really empathize with Amber and her dysautonomia. I always tried to push on and do what was on my errand list for the day, often having to help Amber through the store when all I wanted was to collapse myself. More recently I have been trying to heed the advice I've received to remember my limitations. Until this summer when I was finally diagnosed with the autoimmune I've had for roughly 20 years, I felt like the fraud my old primary doctor tried to convince me I was. I saw myself as a lazy wimp when I couldn't run needed errands, or awake at the crack of dawn and go all day. It takes more than a diagnosis to undo years of disbelief. But I'm beginning to understand I have a chronic illness that greatly affects my daily functionality. This isn't even all of the drinks; my family had already put away a good portion of them. Not to mention the actual groceries. Today we spent the majority of the afternoon out with my mother to help her with some errands and an appliance purchase. However, I really needed a few things from the grocery store too, but knew I would be too run down after our time with Mom. This scenario happens more than I would like. We have an appointment or errand that must happen on a specific day, so groceries get put off and off and off, because I am absolutely exhausted. Or I try the grocery store and end up sick from exhaustion before the food is even put away. Of course my poor husband always offers to do it for me, after a full day of work when he probably is going to help out at home too. That's just not acceptable to me. After much mental debate, last week I signed up for the grocery store delivery service while they had the early sale. Today was my first use of the service. It was easy to use through their app and I was able to scan the item barcodes if I had packaging at home still. Other items I could search by name or department. It worked well, but I wasn't quite ready to let a random person select my produce. I picked a one hour delivery window, during which my personal shopper texted me with questions about unavailable items and let me know when he was on the way to my house. That was actually kinda cool; knowing the layout of the store, I could tell exactly where he was by his questions and how far through my list he was. My shopper brought all of my food inside, with permission, and the service contract states they will even put them away if you ask. 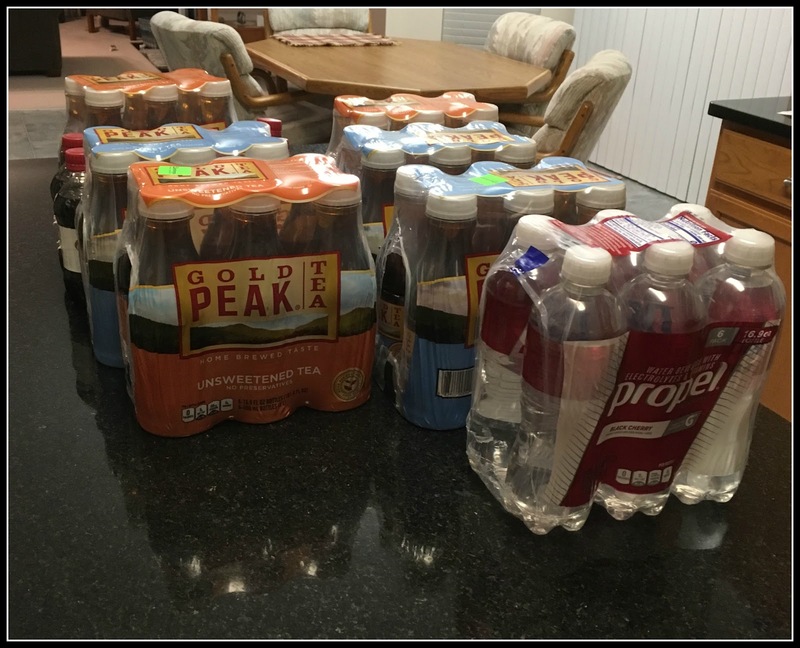 I purchased quite a few heavy drink packages (Propel, tea, soda, etc) and did no lifting whatsoever. It was glorious. Amber and I did not have to exhaust ourselves to th point of sickness just for our groceries, and my food arrived promptly. Nothing was short-dated, and he checked the quality of all the products before checking out. I could not have been more pleased. Next time I'll have to let my shopper try produce and perhaps meat someday. I ended up too sick to make dinner anyway, but I can't imagine how I would have been if we had stopped by the store. We have a busy week and my next reasonable opportunity to stop by the grocery store would have been Friday. With this delivery, now there is the chance I might make dinner several evenings this week. The point of this is although it may seem like an unnecessary service, especially for a stay-at-home mom, sometimes it is through these little changes that those of us who struggle with chronic illness can manage to be a little more functional each day. So, thanks Dierberg's and Shipt for providing a service I didn't want to admit I needed. And for all the jokes my family has been making about me having my own personal shopper.